Why are men so hard to shop for?? This gift guide for men will help you get ready to shop for all the guys on your holiday shopping list. Better yet, we will be able to stay on budget because all of these Christmas gifts for him are under $25! Men….whether it be your brother, boyfriend, husband, son, uncle, dad, grandpa…they are hard to shop for! Every year around Christmas, I always find myself struggling with what the buy the guys on my holiday shopping list. You guys always love gift guides for men, so I figured you struggle with what to buy for him too! 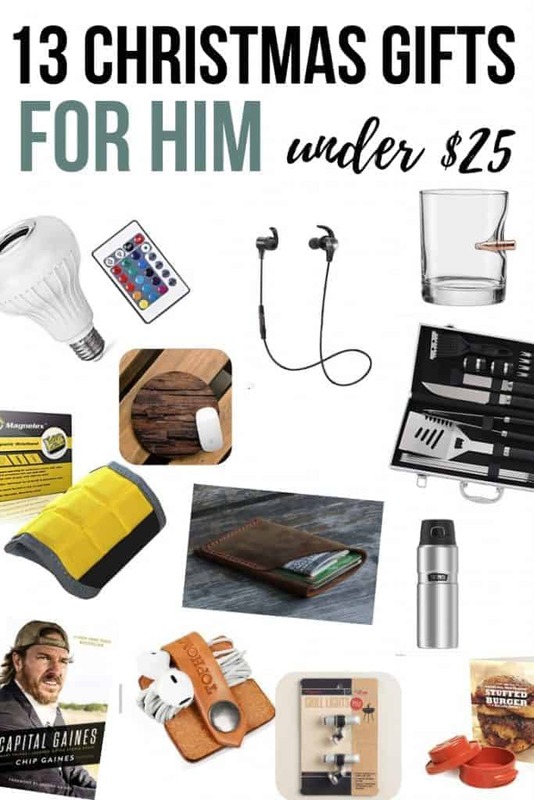 So, I’m at it again…that is rounding up all of the best gifts for him and this time they are totally budget-friendly because they are all under $25! This gifts for himpost contains affiliate links, but nothing that I wouldn’t wholeheartedly recommend anyway! Read my full disclosure here. Ready to see these Christmas gifts for him under $25? If this book is anything like The Magnolia Story, I know it’s going to be epic. I love the writing style that Chip Gaines brings to the table. This time he’s spilling everything he learned in his journal of entrepreneurship or as he says “things I learned doing stupid stuff”. This glass with a bullet in it is pretty cool, don’t you think?! I love that it’s handmade by a small business / maker as well. Bluetooth headphones are all the rage right now, especially with Apple getting rid of the headphone jack in their latest phones. They are also super convenient! Any guy on your holiday shopping list would love a set of wireless headphones. These little magnetic grill lights are so convenient. You can attached them to your metal BBQ tools so you can see what you’re doing on the grill in the shade or dark. Who doesn’t need an extra coffee mug? And this one is bound to be a favorite because it keeps hot for over 18 hours! Coffee cups are a great idea for Christmas gifts for him! This grill set has everything that a master griller would ever need. I love that it comes with an awesome carrying case. I don’t know about you, but it seems like were always misplacing the grilling tools in our house. If there’s one thing I’ve learned about men, it’s that they love cool gadgets and they love speakers. Both my brother and hubby listen to podcasts on the regular, so I know that they would love this bluetooth speaker light. Wouldn’t this be perfect for the bathroom?! Hats are always a good bet when looking for a fail proof gift for him. If you can grab one with this favorite team, even better! These ones are a great classic look and you don’t even have to worry about guessing on his hat size! I love the look of the this slim leather wallet for him. Even if he doesn’t need a new wallet right now, it’s only a matter of time until his current wallet wears out. How cool is this mousepad that look like wood?! This would look great in his office! This is a great gag gift that you can actually use! You can build burgers that are stuffed with things like cheese, onions, peppers…you name it. It even comes with a stuffed burger recipe book. Perfect stocking stuffer for the burger lover! This leather earphone organizer is awesome. My husband is literally ALWAYS losing his earphones. Maybe with this leather cord winder, he’d remember to wind them up and put them away after he’s done using them. Who am I kidding… I’m dreaming, right? Haha. Ok, ok… so this probably belonged more on my gift guide for DIYers, but I found it too late and I just couldn’t NOT share it! It’s a magnetic wrist band that will hold nails, screws, etc while you are working. How genius is that?! I’m usually trying to put them in a pocket or hold them in my mouth and then mumble things to Logan. It’s just not pretty. This is such a great idea for Christmas gifts for him! 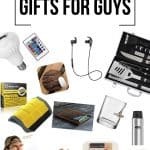 If you are always struggling what to buy for men like I am, hopefully this gift guide for him will help you find a great Christmas gift! If it is your dad or your uncle, there’s something for every guy on your list. Which one of these Christmas gifts for him was your favorite?